This page lists any changes in 5.6 which might affect existing projects when you upgrade from earlier versions of Unity. Changes in data format which may require re-baking. Changes to the meaning or behavior of any existing functions, parameters or component values. The script serialization errors introduced in Unity 5.4 and described in detail in this blog post, will always throw a managed exception from 5.6 onwards. Behaviour in Unity 5.5 is the same as in Unity 5.4. This is now a per-platform setting. Use PlayerSettings.SetApiCompatibilityLevel and PlayerSettings.GetApiCompatibilityLevel instead. PlayerSettings.apiCompatibilityLevel will continue to function, but it will only affect the current active platform. See in Glossary has been removed. As a consequence, LightmapsMode.SeparateDirectional has been removed. Use LightmapsMode.CombinedDirectional instead. For direct specular, stationary lights with real-time direct lighting provide high quality specular highlights in all modes but the subtractive one. Please see the Mixed Lighting documentation in the online lighting section of the 5.6 User Manual. See in Glossary, Screen Space Reflection (SSR), or both. Mixed mode lighting in Unity 5.5 has been replaced with stationary lighting modes in Unity 5.6. This implies a lot of changes, and we advise you to carefully read the Lighting Modes documentation, and in particular the Stationary Modes draft documentation in the online lighting section of the 5.6 User Manual which details the newly available options. Projects from pre-Unity 5.6 will be upgraded to Subtractive mode (see the Subtractive Light Mode in the online lighting section of the 5.6 User Manual. This is the closest match to the Mixed lighting from Unity 5.5. See in Glossary (see the Shadowmask page and the Distance Shadowmask page in the online lighting section of the 5.6 User Manual, especially if you were using the now-defunct Directional Specular lightmaps before). See in Glossary mode. (See the Distance shadowmask page in the online lighting section of the 5.6 User Manual). In Unity 5.6 you can no longer choose whether direct lighting is added to Light Probes from the lighting window. This now happens automatically based on the lights types and the stationary modes. This ensures that direct lighting is not missing and that there is no double lighting on dynamic objects using Light Probes, greatly simplifying the process. 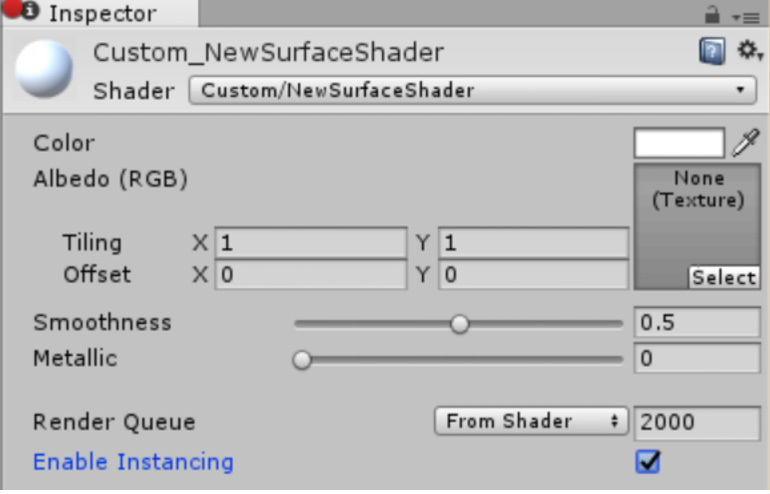 You must now check the new Enable Instancing checkbox for all Materials used for GPU instancing. This is required for GPU instancing to work correctly. See in Glossary to help you regenerate the SpeedTree Materials, so that you can have Enable Instancing checked. Note: The newly introduced procedural instancing Shaders (those with #pragma instancing_options procedural:func) don’t require this change because Shaders with the PROCEDURAL_INSTANCING_ON keyword are not affected. Custom Vertex Streams in the Renderer Module may now require you to manually upgrade your Particle Systems, if you use the Particles/Alpha Anim Blend Shader. In this situation, it is sufficient to simply remove the duplicated UV2 stream. Secondly, the upgraded Emission Module will cause Animation Bindings attached the Burst Emission to be lost. It will be necessary to rebind those properties. Animate Physics: Rigidbodies attached to objects where the Animator has Animate Physics selected now have velocities applied to them when animated. This will give correct physical interactions with other physics objects, and bring the Animator in line with the behaviour of objects animated by the Animation Component. This will affect how your animated Rigidbodies interact with other Rigidbodies (the Rigidbodies are moved instead of teleported every frame), so make sure to verify that your Animators with Animate Physics are behaving as you expect. You should use dynamic batching in upgraded projects that contain 2D sprites. This avoids significant sprite rendering performance issues on devices with Adreno and Mali chipsets. See in Glossary property and disable the Graphics Jobs (Experimental) property. Note that these are the default settings for projects created in 5.6. Graphics Jobs should not affect dynamic batching, but can sometimes cause unexpected behaviors on platforms that use Vulkan and DirectX12. The Unity Test Runner uses a Unity integration of the NUnit library, which is an open-source unit testing library for .NET languages. In Unity 5.6, this integrated library is updated from version 2.6 to version 3.5. This update has introduced some breaking changes that might affect your existing tests. See the NUnit update guide for more information.